Fine needle aspiration (FNA) and cytopathology are important “partners” in the diagnosis of cancer. A fine needle aspiration specialist who is a cytopathologist uses certain tools to increase the accuracy as well as decrease the time it takes to get a diagnosis. But what are these important tools? First let’s define what a cytopathologist is capable of. Pathology is the study of diseases and what causes them. Cytopathology is a branch of the medical field of pathology. “Cyto” means “cell” and cytopathology is the study of free cells or tissue fragments, in contrast to histopathology, which studies whole tissues. Cytopathology is commonly used to investigate diseases involving a wide range of body sites, in order to diagnose cancer but also to diagnose some infectious diseases and other inflammatory conditions. For example, a common application of cytopathology is the Pap smear, a screening tool used to detect precancerous cervical lesions which may lead to cervical cancer. These are sometimes called smear tests because the samples may be smeared across a glass slide for subsequent staining and microscopic examination. Additional training above and beyond the usual medical residency in pathology is required to become a cytopathologist, the doctor who reads and interprets these tests. The cells can be obtained by scraping or washing the surface of a suspected tumor, but also can be extracted, as in an FNA biopsy. A fine needle aspiration specialist inserts a very thin, fine needle into the area of a suspected tumor and removes cells or tissue with or without suction. Many different types of doctors can perform a fine needle aspiration (i.e. endocrinologist, ENT, surgeon), but only a cytopathologist is able to interpret the slides made from the sample. As these other doctors cannot analyze the tissue during the time of the procedure, they cannot ensure that there is adequate or correct sampling and the patient may end up having to come back for a repeat biopsy. Providing expert analysis and performing rapid on-site evaluation (ROSE) of the sample is one of the primary roles of cytopathologists. 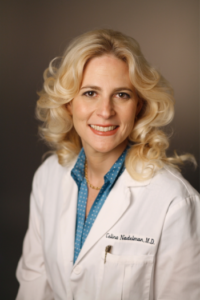 Dr. Celina Nadelman is a board-certified cytopathologist who provides hands-on care as well as diagnostic services. She sometimes refers to her practice as a “one-stop shop,” since you can have an FNA biopsy and then get the diagnosis from her within a day or so. Quick turnarounds mean less patient anxiety and a quicker return to one’s daily routine.